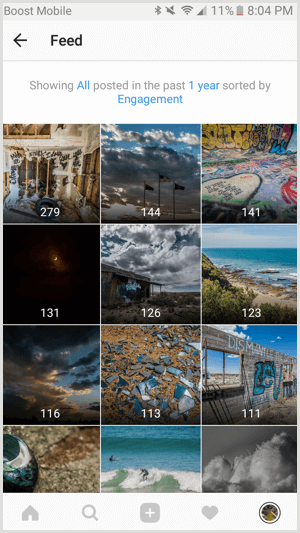 Want to batch-process your Instagram updates? Looking for tools that schedule and publish content directly to Instagram? In this article, you’ll discover six social media tools that let business profiles schedule posts directly to Instagram. 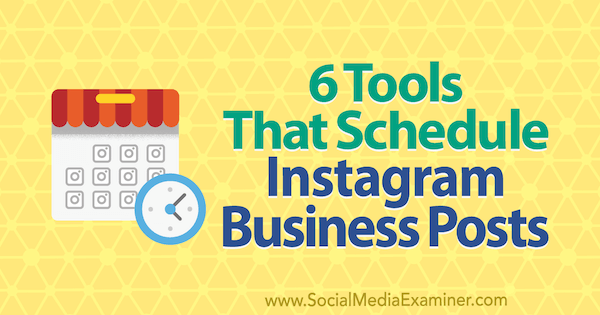 6 Tools That Schedule Instagram Business Posts by Kristi Hines on Social Media Examiner. To use any of the social media management and scheduling tools that can post directly to Instagram, you need a business profile. To find out if your account is set to a personal or business profile, go to your settings and look for the option to either switch to a business profile or switch back to a personal account. If you see the latter, you’re set. Otherwise, tap on Switch to Business Profile to convert your personal profile into a business one. Once you’ve converted or confirmed you have a business account, you’ll want to connect your account to a relevant Facebook page. Be sure that your Facebook page’s information (especially the page category) is accurate before connecting the two. 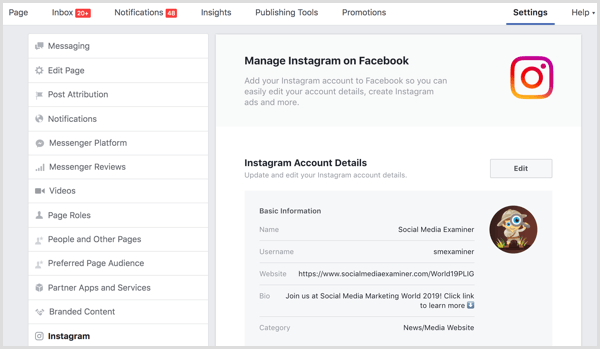 Some information from your Facebook page will be added to your Instagram business profile. 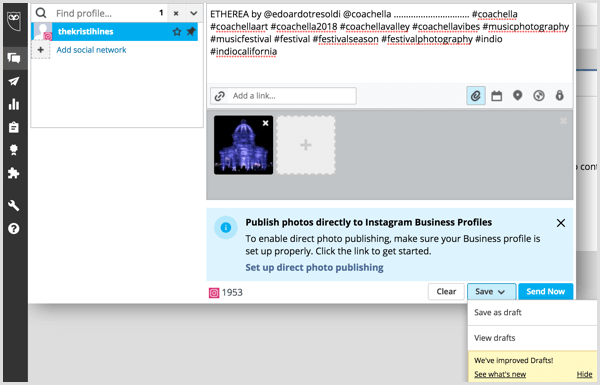 The following six social media management and scheduling tools allow you to manage direct posting and scheduling from your desktop browser to Instagram. While other tools are available that will directly post to Instagram, these are some of the most popular. Keep in mind that not all Instagram posting features are available when scheduling posts using third-party social media tools. For example, most only allow direct posting of photos (no videos), and you may not be able to use locations or user tagging. Some tools also require you to download the app to your phone. Be sure to review each tool’s instructions about Instagram direct posting (linked below) to see what their service supports. Later is a visual content planner that offers direct publishing and scheduling to Instagram, Twitter, Facebook, and Pinterest. 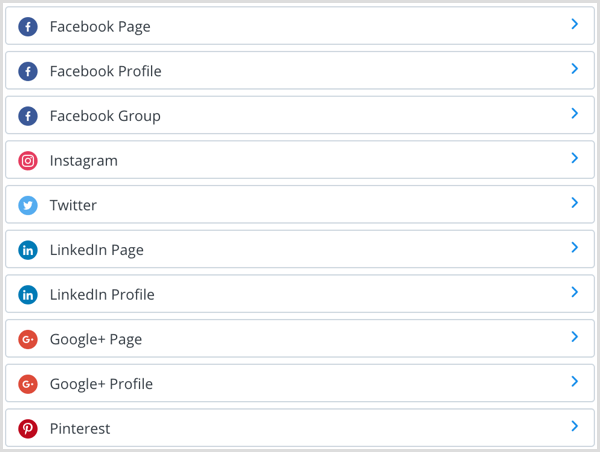 You can create a free account to manage one of each of the aforementioned social profiles for one brand. If you create your account with Instagram, you’ll be prompted to set up direct publishing on your first login. Once you set up the app, you can start dragging photos from your computer to your Later calendar and schedule them to post to your business account. Zoho Social offers direct publishing for Instagram, Twitter, Facebook pages, LinkedIn company pages, and Google+ pages. 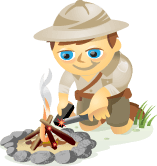 Users with the free plan can manage one of each of the aforementioned social properties for one brand. Plans with additional team members and features start at $10 per month. 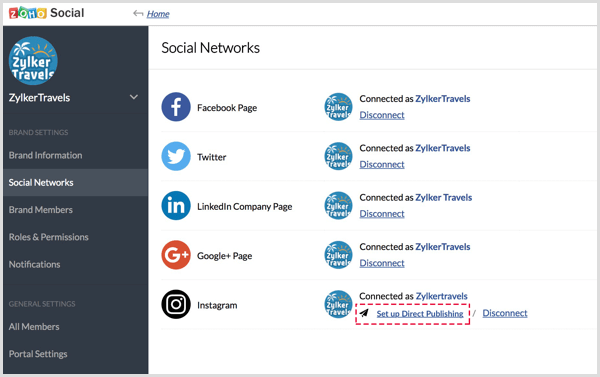 To authorize Zoho Social to publish directly to your Instagram business account, click the Set Up Direct Publishing link. 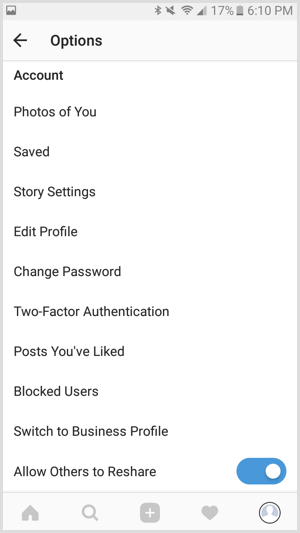 You can manage up to 10 posts for up to 3 of the above social media accounts (with the exception of Pinterest) for free. Plans for additional posts and social media accounts start at $15 per month. 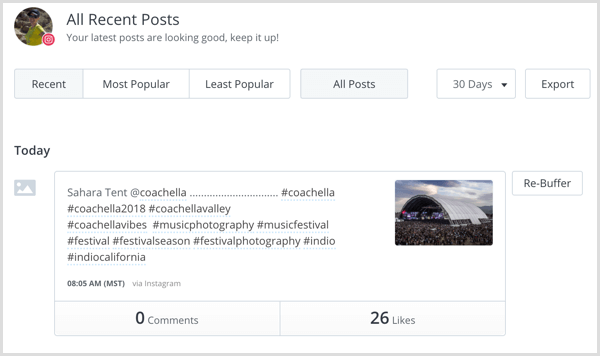 Once you’ve connected your Instagram business profile to Buffer, you’ll be able to use their direct posting feature to immediately publish, queue, or schedule photo posts with a caption. Buffer will post content to your Instagram account automatically, without reminders or requiring confirmation on your mobile device. Hootsuite is a social media management tool that allows you to publish and schedule posts directly to Instagram and other social media account types, including Twitter profiles, Facebook (profiles, pages, and groups), Google+ (profiles and pages), and LinkedIn (profiles and company pages). 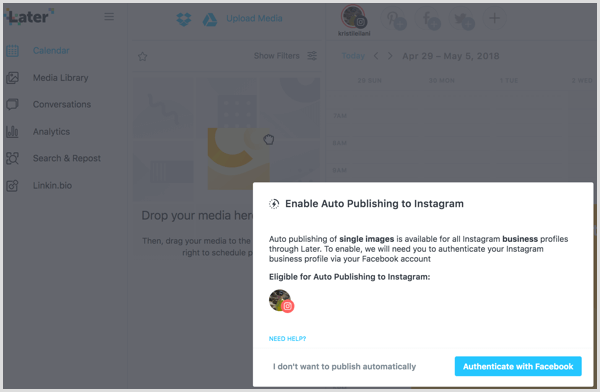 After you’ve connected your Instagram business profile to Hootsuite, you’ll be able to directly post photos or schedule photo posts. 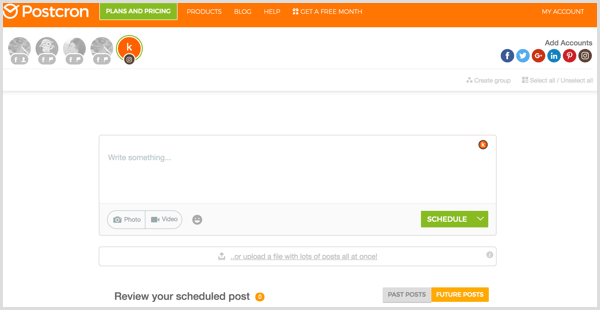 Hootsuite’s free plan allows users to manage up 3 social media accounts with up to 30 total posts scheduled at a time. For additional posts and social media accounts, plans start at $19 per month. Postcron is a social media scheduling tool that allows you to directly schedule posts to Instagram, Facebook pages, Facebook groups, Facebook events, Twitter, LinkedIn, Google+, and Pinterest. Once you’ve connected your Instagram account, you can schedule one or more posts at once using their simple scheduling dashboard. Plans start at $14.99 per month for management of up to 10 social media profiles and up to 200 scheduled posts per month, and you can try it out for free for 7 days. 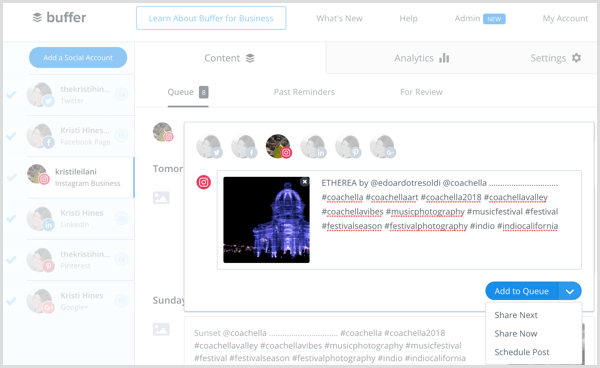 Sendible allows you to publish and schedule posts directly to Instagram and a large selection of other social media networks, blogging sites, and other platforms. 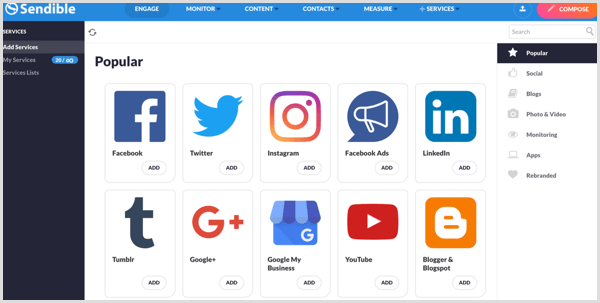 Sendible plans start at $29 per month for up to 4 social profiles and 12 services (posting to Twitter, monitoring a Twitter hashtag, posting to Instagram, and posting to a Facebook page would count as 4 services on 3 social networks). Depending on the social media tool and pricing plan you choose, you may be able to access analytics about your Instagram posts published through that service. If you don’t have insights from your social media tool, visit the Instagram app to view the insights provided for business profile users. You can get insights on how each post led to specific activities including calls, comments, emails, engagement (total), follows, get directions, impressions, likes, profile visits, reach, saves, texts, and website clicks. 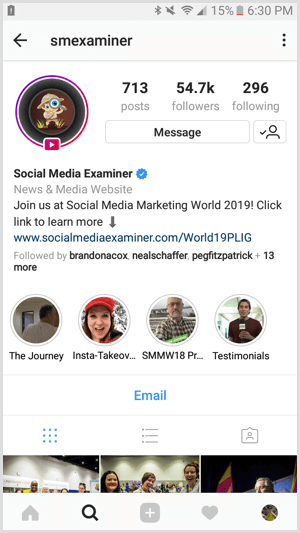 These insights are available for posts published from the Instagram app and posts published directly to Instagram from a third-party social media tool. The new direct posting to Instagram feature available to users of these social media management and scheduling tools allows businesses to keep their business profiles up to date with great content without the hassle of switching from desktop image editing to smartphone reminders at the desired time of posting. What do you think? What other services allow Instagram direct publishing? How will this change the way you publish to your business profile? Let us know in the comments!